No matter how laissez-faire I am about other parts of my beauty routine, I’m admittedly much more uptight about my hair. I consider dyeing my hair to be a high-risk, high-reward situation. Maybe it’s my anxious nature talking, but before a color session, I envision all the things that can go wrong—streaky highlights, damaged hair, or dye dripping on my skin. A knowledgeable professional can always reverse harsh color separation, and I know of a number of great hair masks that can counteract any damage, but dyed skin is something I’m woefully unprepared to deal with. After all, no matter how much you love your new hair color, you don’t want your skin to match. So, in an effort to prevent and remove stains, I reached out to some experts—dermatologist Nava Greenfield, MD, of Schweiger Dermatology Group, Courtney Goebel, color expert at eSalon, and celebrity colorists AJ Lordet and Giselle from Pierre Michel Salon in NYC. Keep reading to see their tips and tricks on how to get hair dye off of skin. Goebel agrees, saying “at eSalon, each order includes stain guard and stain remover for a tidy, stain-free experience. If you don’t have stain guard, don’t sweat it. Petroleum jelly works wonderfully to prevent hair color stains. Just swipe an even amount of product around the hairline and on the ears.” Keep in mind that the Vaseline will block color from reaching the hair, so Lordet makes it a point to apply it cleanly and evenly on the skin only. Be sure not to get any on grey hairs especially. "After the color is applied, wipe up any that dripped on the skin (always wear gloves, it never comes off finger nails! )," Lordet says. "A tissue is good for the wipe off." Goebel also advocates for cleaning up the hairline regularly throughout the dye process to catch drips ahead of time. “Since heat from the scalp can sometimes make color run, definitely check on the progress of your hair color during processing. To ensure color doesn’t run down the back of the neck, I like to loosely twist the hair up and clip up the ends. Now the hair is up and out of the way while the color processes,” she says. If your color does start to run, she recommends reaching for another drugstore product. So we’ve covered how to prevent stains, but what about when there’s hair dye on your scalp and around your hairline? As Goebel put it, “removing hair color from the skin can be tricky, but it’s definitely not impossible.” She uses an old stylist trick, which, however backward it might sounds, uses the hair color itself to remove hair dye from the scalp. “After your hair color has processed, pop into the shower. With gloved hands, add a little water to the hair,” she says. “Starting at the hairline, massage the hair color in circular motions away from the hairline. Continue to massage the full scalp for two to three minutes. The act of massaging helps to warm up the color, removing it from the scalp and also adding shine to the hair. After the color has moved away from the scalp and feels creamy, rinse the hair color out thoroughly.” Afterward, use a color-safe shampoo and conditioner like eSalon Heart Lock It Color Care Shampoo ($15) and Love Unconditionally Color Care Conditioner ($15). If the color has dripped down your neck or face, Greenfield says it’s not the end of the world. “Hair dye will fade usually within just a few days from the skin if you do nothing, but if you want to remove it more quickly, you can rub petroleum jelly (using a glove or wipe) gently into the skin. 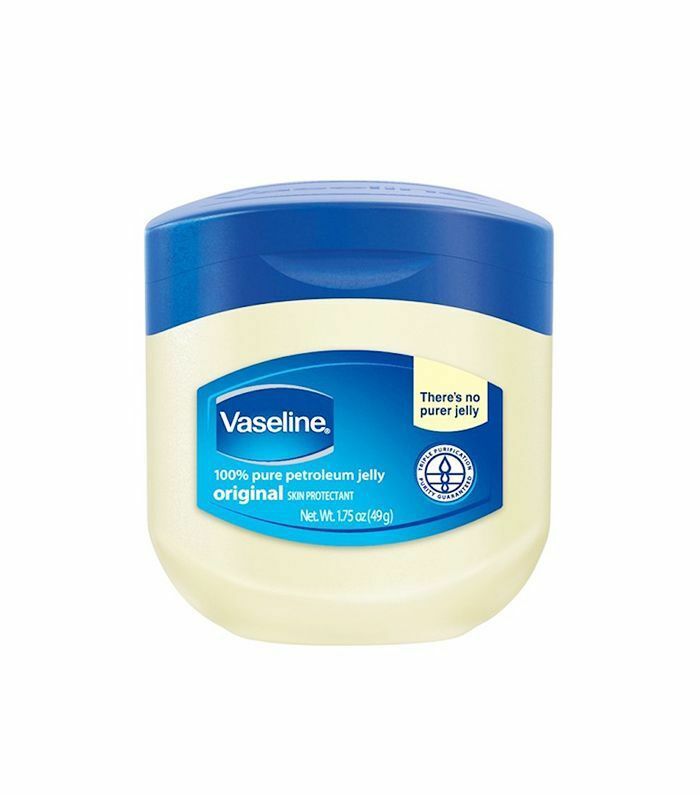 The petroleum jelly will absorb most of the dye, and then you can wipe it away.” May we pause here to ask, who knew Vaseline was so useful to the dyeing process? We have a new appreciation for the stuff. “If that doesn’t completely do the trick,” she continues, “try some gentle soap or non-scented laundry detergent. Lather it up, and then rub it gently on the affected skin. Rinse and repeat until the desired effect is reached.” Try Cetaphil Gentle Skin Cleanser ($10). The drugstore classic is fragrance-free and non-comedogenic, so it won’t irritate stained skin (even after repeated use). When all else fails, Giselle turns to an inexpensive, yet effective product: Roux Clean Touch Hair Color Stain Remover ($6). Simply pat it onto the stained skin with a cotton ball and rinse. "Its affordable and works great," she says. Next up, read about how much hair loss is considered normal.